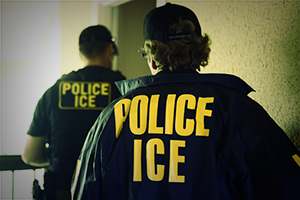 Over the course of three days, Immigration and Customs Enforcement (ICE) agents recently engaged in a series of 77 proactive worksite operations focusing on employers in the state of California. The actions were focused specifically on north-central California, including the San Francisco Bay Area, and follow recent worksite operations against nearly 100 7-Eleven stores around the nation, including California, in which several illegal aliens were taken into custody. A number of media outlets described the actions as "raids" (see, for example, here and here), although there is ample reason to dispute that terminology, redolent as it is with the vision of sweeps resulting in illegal aliens who are unlawfully employed being hauled away in handcuffs to face removal proceedings before an immigration judge. A careful examination of the news stories indicates very clearly that a) no aliens were arrested; and b) the employers at each site were served with notices that their employer verification forms I-9 — preparation and maintenance of which are requirements of the law — will be audited. Thus, this action is more along the lines of a white collar enforcement process that is heavily oriented on reconciling the employer's hiring-and-firing books and records, with the I-9s on file (or not, as the case may be). I-9 audits are also a prime opportunity to divine whether bogus documents are being used by unauthorized workers to prepare those I-9s which do exist, and to try to determine whether such documents were either facilitated or accepted with a wink-and-a-nod by the employers targeted. ICE has chosen not to dispute the depiction of these enforcement actions as raids, even though they clearly were not, and probably for a very good reason. The agency is clearly sending a message to employers nationwide — but, more specifically to the State of California, which has declared itself a sanctuary and even gone so far as to enact its own state-level laws prohibiting employers from cooperating with ICE — that "business as usual", at least as conceived of during the prior eight years of the Obama administration, which engaged in virtually no worksite enforcement, is over. ICE public affairs officials have indicated in statements about these most recent worksite audits that appropriate civil and criminal penalties will follow completion of the audits. The very fact that this is said suggests that ICE agents may have gone into at least some of these worksites knowing, or strongly suspecting, that fraud and collusion were being used by employers to hire illegal aliens in ways designed to circumvent a legitimate I-9 employment eligibility verification process. As the aphorism suggests, a journey of a thousand miles begins with a single step. I believe we may have seen the first two steps by ICE in its journey toward obliging U.S. employers to hire only Americans and lawful workers, while at the same time reminding California and other recalcitrant states that in our federal system, they do not get the last say on immigration, which is a power reserved to the central government by our Constitution.